All things Downton. . . I confess to being a latecomer to Downton fandom. It was toward the end of the third season before, tired of hearing conversations about people and places I just didn’t know, I took the leap and became totally addicted. 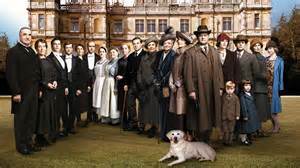 My daughter and I then, in a viewing frenzy, attempted to quench our thirst for all details of Downton’s past by viewing seasons one, two, and the totality of season three on DVD. Ah, the satisfaction! Season four was savored in real time as we DVR’d each episode and saved it for a time we could view together–sometime that the male members of our household were otherwise occupied. And now we are likewise engrossed in a week by week feast of the people and plots of Downton. And now I see, as I “shop PBS” that the Season 5 DVD (U.K.Edition) is “available, in stock, and leaves warehouse in 1-2 full business days”, along with a FREE Downton Abbey Sampler Pack of 6 Teas!! Who would have thought you could see Season 5 in one marathon viewing session before the rest of its devotees have seen episode four? I’ve been attempting to decipher the elements of our attraction to the Downton Abbey saga. This is a very complex issue. I do love the fashions. The costuming is veritable eye candy, even when worn by Dowager Lady Grantham. Of interest are the different fashion tastes that have been apparent as one compares Lady Mary’s attire with that of her sisters Lady Edith and, the now deceased Lady Sybil. And then there’s cousin Rose to consider, with her youthful, rebellious, yet charming ways. Then there’s the more intellectual enticement of the morsels of historical facts that are strewn throughout the plot. The reign of King George the V of Great Britain is the backdrop for this tale of aristocracy and those who serve them. The sinking of the Titanic claimed the lives of Lord Grantham’s cousins, James and Patrick, and we all remember his distress that a mere third cousin once removed thus became his heir. The horror of the Great War (WW I) did not leave the household unscathed. Topics of socialism, racism, sexuality, and women’s rights pervade the story. There’s more here than just romance. But, romance there is. Sometimes my Bible-belt morality is, indeed, a bit taken aback by the turns and twists of relationships, but, through it all, one finds oneself developing a fondness for the all-too-human characters and their frailties. But, at this moment, on this day, I think the thing that enchants me most is the freedom that the aristocracy has to pursue various interests. After all, they don’t clean. They don’t shop for food. They don’t cook. They don’t do laundry, nor do they mend clothing or polish shoes. They don’t drive or dress themselves. They have all the time in the world to do whatever appeals to their fancy. That sounds rather, well, tacky of me, doesn’t it? You have to understand my life at the moment. I try to be an excellent healthcare provider, which occupies a major portion of my time. At my house there is cleaning and laundry and shopping and cooking to be done, and, trust me, I seem to do a lot of it. There are demands on my time that I prioritize highly–teaching a Sunday School class, singing with the church choir as we lead worship, daily devotion, regular worship, acts of service. I do not begrudge these things–they bring me joy. Yet, there is the “other thing”. I long to be a productive writer. This is the thing that gets placed on the back burner, shoved to the back of the line, listed last on “things to do today”. And, somehow, someway, I must find the discipline to make the time, focus the mind, and, as Nike puts it, just do it. Because I am convinced I am meant to do it. I am convinced I have things to say. Perhaps they are not great things in the literary sense–I’m rather sure they’re not. But words that inspire, entertain, and tell a story–the act of drafting, editing, and sharing words like that is, perhaps, another calling for my life, just as nursing has been. So, dear reader, send a prayer my way that I will find my way, please? Previous postA cup of tea. . .
Next postIf you’re happy, and you know it . . . .